UMPI to establish downtown gallery, art studios at 149 State St. The University of Maine at Presque Isle will soon have a physical presence in downtown Presque Isle as part of a major project to establish the region’s very first facility dedicated to the visual arts. UMPI officials are partnering with the Wintergreen Arts Center on this project that not only supports the region’s growing arts community and efforts to spur economic development, but also encourages innovation in academic and community education. During a press conference held on June 26, officials from the University and the Wintergreen Arts Center announced the details of the project. The two entities are working with building owners, the City of Presque Isle, and several other partners to transform 149 State Street (known locally as the old Wight Furniture Building) into the Northern Maine Center for the Cultural Arts. The building already houses the Wintergreen Arts Center on its first floor, but will soon feature UMPI’s Downtown Art Gallery on the second floor and UMPI’s Art Studio Space on the third floor. The project also includes hiring a dedicated cultural outreach liaison to coordinate community cultural endeavors at the new center, engaging partners in the development of a five-year cultural plan for Presque Isle, and creating a green space in the parking area behind 149 State St. The project is expected to benefit students, the arts community, the downtown area, and the community at large. The cultural center project is expected to cost about $257,000. So far, officials have raised about $89,500 in cash, in-kind donations and grants, including a recently awarded $50,000 Maine Arts Commission Creative Communities = Economic Development grant [CCED]. The grant is designed to support dialogue and partnership between municipalities, businesses, and the cultural sector regarding economic development. The project is being led by grant administrator Wendy Gilman-Zubrick, WGAC Executive Director, and project director Heather Sincavage, UMPI Art Professor and Director of UMPI’s Reed Fine Art Gallery. “Our goal is to have the Northern Maine Center for the Cultural Arts serve as a location of excellence that attracts leaders to the local community, integrates the University into the downtown district, and becomes an avenue for student engagement and community development,” Michael Sonntag, UMPI’s Provost and Vice President for Academic Affairs, said. The 2,300-square-foot second floor space will include an expansive, museum-quality art gallery that will allow for the display of large art work and higher profile exhibitions, as well as larger group exhibitions. The space will also include an office and room for climate controlled storage of artwork. Established as a sister space for the Reed Fine Art Gallery on the UMPI campus, the downtown gallery will serve as a showcase for established and emerging artists. It will also serve as a real-world learning space for students developing skills in the arts, education, and business, allowing them to gain experience in the professional practices they’ll encounter within the art field. The building’s 2,300-square-foot third floor will be converted into art studio space for local and emerging artists. This first-of-its-kind space for the region will provide participating artists with high quality studio space to rent and a built-in arts-centered community atmosphere in which to work. The floor will be divided into six to eight art studios with artists being encouraged to hold gatherings and classes/lessons in their spaces. Artists will also take part in First Friday art walks and volunteer and engage with Wintergreen and downtown gallery programming. The rent artists pay for their studios will help to keep the cultural center sustainable going forward. The project also includes the replacement of the building’s elevator, a hydraulic unit with openings on all four floors, and the addition of a new, safe green space to be developed behind 149 State St., making the area more attractive to foot traffic. Right now, that space is used for parking. In the future, it will be transformed into a space with walkways, floral edges, outdoor umbrella tables, and an outdoor mural. An exciting and innovative component of the project is the establishment of an Emerging Artist Program. This teaching residency, expected to start in August 2014, will bring an up-and-coming visual artist to the Presque Isle cultural community on a yearly basis (through a national call for artists and a juried process). The selected emerging artist will work with UMPI Fine Art students and members of the public during a year-long appointment. With a stipend of $10,000, he or she will teach two courses, create a body of work based in a studio provided on the third floor, produce a show in the downtown gallery, and give a community lecture. The artist also will be encouraged to give community workshops and participate with Wintergreen and the downtown gallery. “Not only will this teaching residency distinguish UMPI’s Fine Art Program from others in the state, it will provide a diversity and richness to our program, keep the program contemporary, and bring a global dialogue to the area,” Sincavage said. 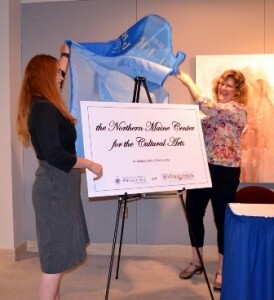 To direct all the important work that will be underway at the Northern Maine Center for the Cultural Arts, officials are hiring a Cultural Outreach Liaison to coordinate between consortium partners, city officials, business owners and groups/organizations in the downtown, and be responsible for collaborative programming and cultural marketing of the region, as well as related funding needs. Among the most important work the Cultural Outreach Liaison will undertake is to help put together a five-year cultural plan to address the vision of arts and culture in Presque Isle. The funding officials have in hand so far will cover the costs of Phase I of the project: renovation and construction work to the second and third floors, computers and audio/visual needs for the second floor, the Cultural Outreach Liaison salary for one year, a portion of space rental, and development of both the Emerging Artist Program and the marketing strategy. Phase II will include the replacement of the building’s elevator and implementation of the Emerging Artist Program and the marketing plan. The Maine Arts Commission is actively helping NMCCA project officials to find other grants to support Phase II of the project. Officials hope to begin Phase I renovation and construction efforts this summer.